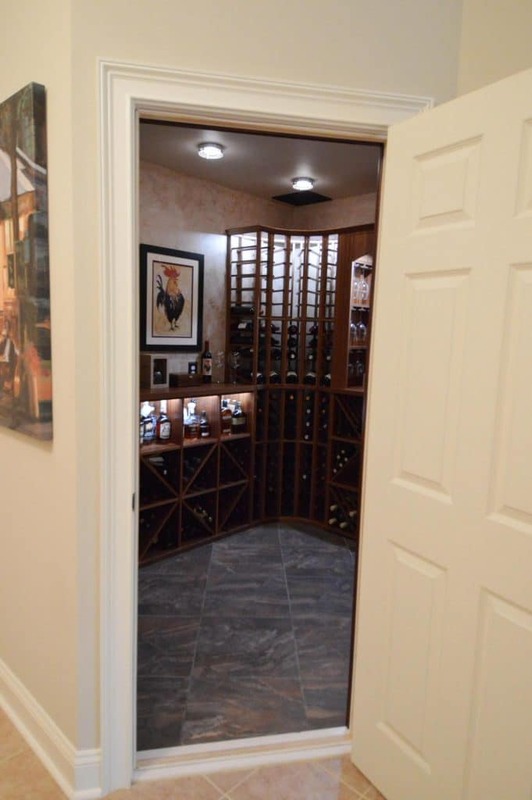 The wrong choice of door will break the overall appeal and functionality of your wine cellar. Therefore, you must consult with an experienced designer who offers gorgeous styles of doors and can help you determine the most suitable entrance for your cellar. At Harvest Custom Wine Cellars, we offer tastefully designed doors to create a grand entrance to your wine storage facility. Some people are not aware that choosing the wrong door for their wine cellar can break both the functionality and aesthetic appeal of the room. A builder who lacks knowledge in proper storage and doesn’t understand the importance of choosing the appropriate door will ruin your investment and compromise the appearance of your wine cellar. When designing a wine room, Harvest Custom Wine Cellar and Saunas is keen about choosing the right components and style for our client’s wine cellar. We do not take the door for granted. We have extensive experience in designing and installing wine cellar doors in Baltimore. We understand that it plays a significant role in maintaining the ideal environment required for proper wine aging. 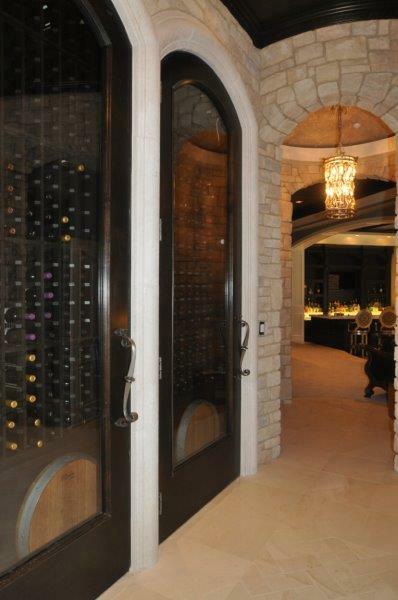 Moreover, we offer various door styles that will impress guests as they enter your wine room. A wine cellar equipped with a climate-control system should have a commercial grade door that can withstand the humid conditions. At Harvest Custom Wine Cellars, we construct our doors with 1 ¾” thickness to prevent warping. If your wine cellar door warps due to dampness, it will allow air leakage to and from the cellar, resulting in unstable conditions. Our doors are available in durable types of wood such as Knotty Alder, Premium Redwood, Mahogany, and Pine. We will help determine the best material for your door after making a careful assessment of your needs. If condensation forms in the cellar, your wines will be at risk. To prevent this wine storage problem, Harvest Custom Wine Cellars and Saunas insulate, not only the walls, ceiling but the door as well. We understand how vital insulation to all of these areas (including the door) are because we care about protecting your wines. Creating a tight seal is an integral part of building refrigerated wine rooms. 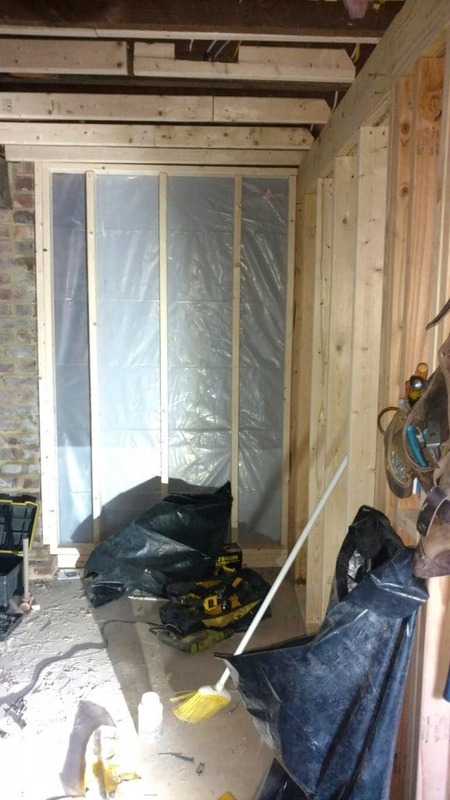 Room insulation will prevent the warm air from entering and the cold air from escaping the cellar. We install doors with weather stripping on all the edges. This process seals the gap around the door, preventing air leakage. Installing an automatic door bottom is also essential because it automatically closes the door if someone leaves it open. It helps prevent the wines from spoilage due to temperature fluctuations caused by leaving the door open for a long time. Invest in a door that will make your guests envious of your wine room. Remember that the door is the first thing that guests see in your wine cellar. Therefore, choosing a reliable designer, like Harvest Custom Wine Cellars and Saunas. We offer various door styles that will make your wine cellar stand out from the rest. You may opt for solid wood, seamless glass, wrought iron, or a combination of these styles. Wooden doors are one of the favorite options of wine cellar builders, interior designers, and contractors. It adds a classic and warm appeal to the wine cellar. Our solid wood doors are manufactured using the LVL (Laminated Veneer Lumber), a process where we use adhesives to connect multiple layers of thin wood. The two main benefits of this technology are: 1) makes the door more durable and stable and 2) provides better insulating properties. At Harvest Custom Wine Cellars and Saunas, we make sure that every wine cellar we build has proper insulation. Doing so will help prevent interfering the cooling process of your wine cellar. Poor insulation will force the cooling unit to work harder than it normally should. This can result in the breakdown of your wine refrigeration system. When this happens, you will spend on the repair or replacement of your cooling equipment. Moreover, it will result in high-energy consumption. 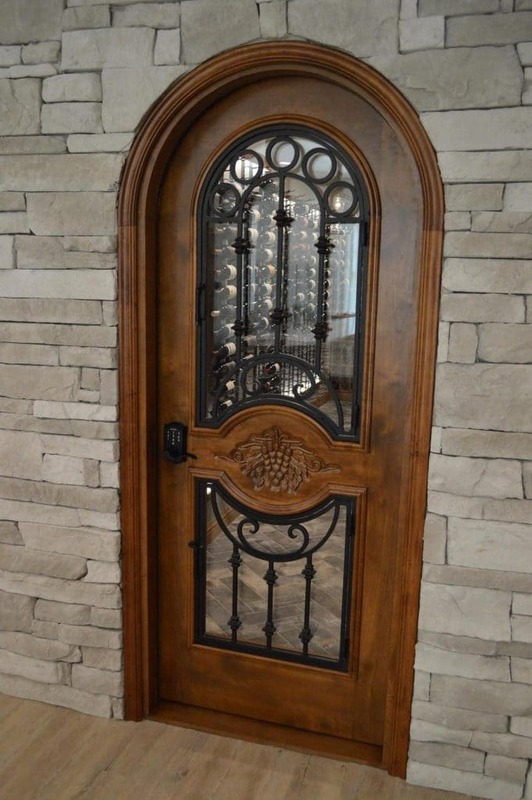 Adding a vintage touch to wine cellars with a wrought iron door is increasing in demand among residential and commercial establishment owners in Baltimore. Our hand-forged wrought iron doors are constructed by skillful craftsmen using 1 1/5” thick iron. The most common style of wrought iron door is the grapevine design. You can create your own style and request our team to incorporate it on your wrought iron door. Wrought iron doors usually come with glass panels, which are installed on the interior of the door. We also insulate the glass panels to help prevent air leakage. 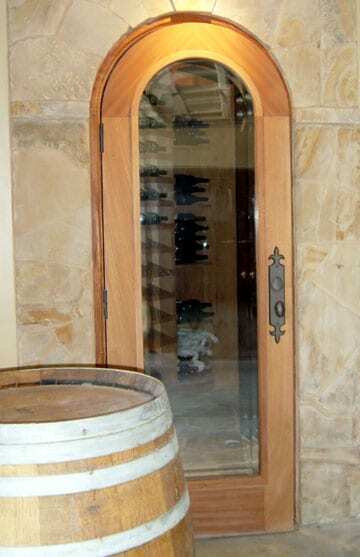 Another door style that is becoming more popular in wine cellar construction is the glass wine cellar door. At Harvest Custom Wine Cellars and Saunas, we recommend glass wine cellar doors for wine enthusiasts who love modern design and want to allow maximum visibility of their collection. If you are an owner of a restaurant, hotel, bar, or retail wine store, and want to generate sales, a seamless glass wine cellar door is the best option. You can place your wine display and storage area in an area where your customers can easily see them. An elegant wine cellar will encourage diners to check out and purchase the wines that you sell. Are you looking for a top-notch wine cellar builder in Baltimore who manufactures stylish doors? At Harvest Custom Wine Cellars and Saunas, all of our doors are made using our extensive knowledge, passion, and creativity both for residential and commercial applications. Need help? Call us at 804-467-5816!